Courtyard by Mariott hosting a Rajasthani Food festival didn’t really catch my fancy the 1st time I heard of it. Then the rain gods showered their blessings and the weather demanded indulgence, which led me to Mariott since it’s a short ride away from my place. 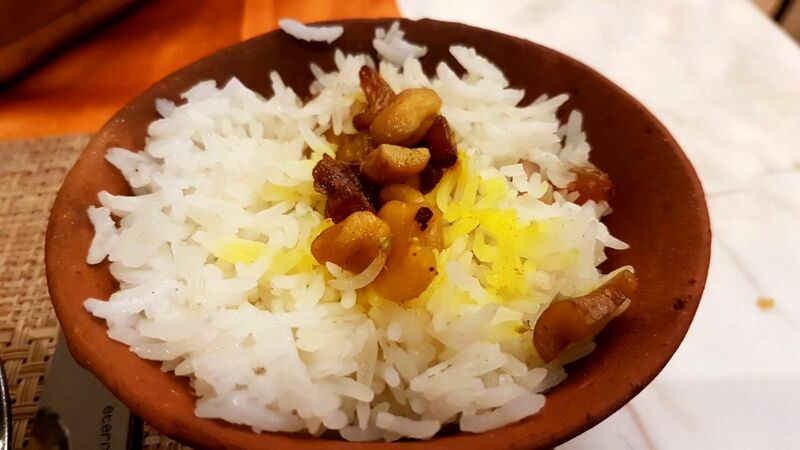 Given that Rajasthani food festivals are pretty much the norm and the desert cuisine with its multi grain feast and rich flavours is difficult to go wrong with. At the same time it is difficult to do something out of the ordinary with this cuisine that would make me go gaga all over it. And that’s for someone who has been feasting on Rajasthani food since childhood, having travelled the length and breadth of this amazing land and its neighbouring states. This perception started to wither with the 1st taste of the soup of the day. The soup was makki ki raab which is roasted corn cooked in yoghurt and simmered for a really long time resulting in an earthy preparation that warms up your body and no wonder is quite popular in winters. 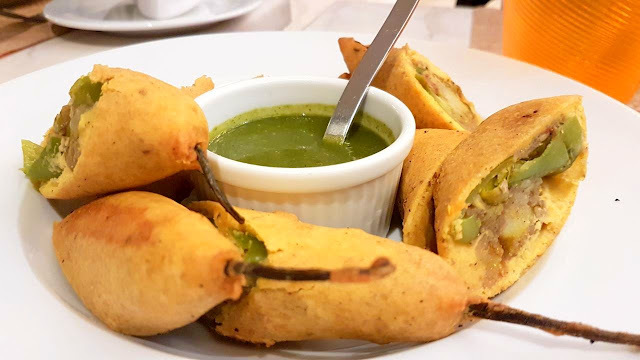 Mirchi vadas appeared on the plate and were as good as anything else I’ve had before. 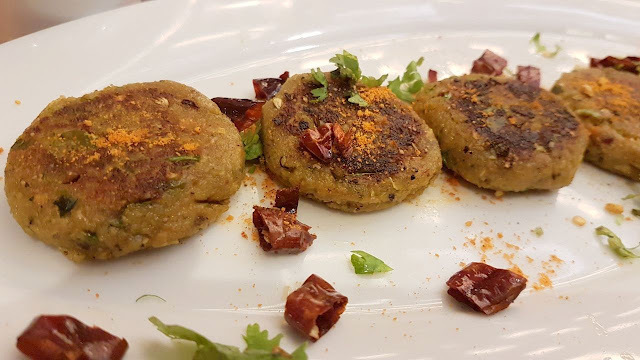 Something new, exotic was what I wanted and my wish was granted in the form of Mungodi Kebabs which with its tongue tingling seasoning worked its magic on me. What’s a Rajasthani food festival without some Dal Bati Churma? I for one never miss a chance to savor this traditional delicacy. 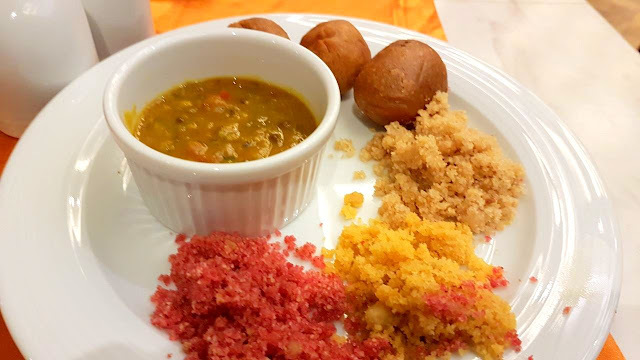 It was a hattrick of sort with not 1 but 3 types of batis- plain bati, masala bati and my personal favourite the mawa bati that I can bet you won’t stop at 1. The buffet table showcased the popular dishes from Sev Tamatar, to Jaipuri paneer and not to forget the Ker Sangri. Rest assured all of this did live up to my expectations and more! What deserves a special mention is the Gatta curry. This one was stuffed with khoya and cooked in a yoghurt gravy that was tangy, rich, and a delight for the tastebuds- making me ask for repeats. This was also my first experience of tasting Mawa Pulao which is a traditional rice preparation, in which cooked rice is topped with some khoya (yes again) , dry-fruits and cooked on hot sand for around 6 hours resulting in a sweetish nutty accompaniment to the spicy Mungodi Alu. My gluttonous indulgence continued despite those piquant mains and the Ghewar was the grand finale of this feast. Unlike its soggy counterparts found in the millennium city this one not only was sinfully delicious but the textural contrast is what caught my attention. The luscious khoya layer (I know again) complemented the crispy bottom and without getting into the subtler nuances. It suffices to say this one can only be had at the Courtyard by Mariott for now and today is the last day! I need to way to you to percentage it. it's far really what I desired to peer hope in future you'll retain for sharing such an fantastic put up. I’m very fired up to reveal it to each person.custom essay writing service delivering proper hints and additionally providing all form of writing papers so each pupil choosing their writing paper easily.